There is no development release now. 31 Jan 2018 Sylpheed 3.7 (stable) has been released. 18 Jan 2018 Sylpheed 3.7beta1 (development) has been released. 29 Jun 2017 Sylpheed 3.6 (stable) has been released. 29 Jun 2017 The Windows binary module of Automatic Attachment Encryption Plug-in sylpheed-autoenc-plugin is available. 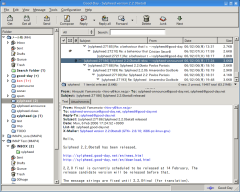 12 Jun 2017 Sylpheed 3.6beta1 (development) has been released. 29 Jul Sylpheed 3.5.1 (stable) has been released. 25 Jan Sylpheed 3.5 (stable) has been released. 13 Jan A generic spam filter tool SylFilter 0.7 has been released. Sylpheed provides intuitive user-interface. Sylpheed is also designed for keyboard-oriented operation, so Sylpheed can be widely used from beginners to power users. Please send your comment and/or bug report to Hiroyuki Yamamoto <hiro-y at kcn.ne.jp>.